Comfy socks to keep little toes cool and dry in the summer and warm and cozy in the winter. Constructed of 85% bamboo viscose and 15% stretch nylon for comfort. Super absorbent and soft, and perfect to wear year round. 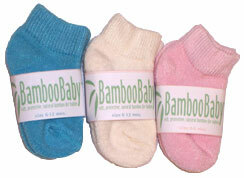 These socks will keep baby's feet cozy and warm in the winter and cool and dry in the summer. 0-12 months. Made in the USA.